The A' Excellence in Design Competition is a freestyle design competition open to portfolio of both concept stage and realized project portfolios designed by professional designers, design studios, design offices, design agencies, design companies by worldwide. The A' Design Award for Excellence in Design is not just an award, it is the indicator of quality and perfection in design profession, the award is recognized worldwide and takes the attention of design oriented companies, professionals and interest groups. Winning the A' Award is a certificate of excellence for designers, an important milestone in your career. 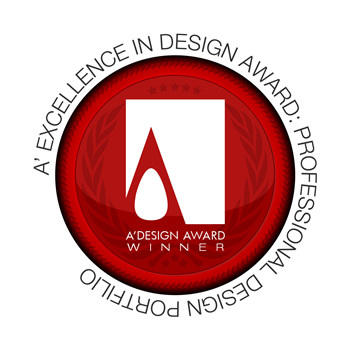 The winners of the Excellence in Design Award are provided extensive and exclusive marketing and communication services to promote the success of winning the A' Award. Furthermore, the winning designs appear on the A' best designs book which is available worldwide, this book is furthermore distributed to the high-profile magazine editors, design oriented companies and relevant parties. The winning designs are also exhibited at our exhibiton, and the best designs will be picked for the permanent exhibition. The winners appear on magazines, newspapers, webzines and many other publishing mediums. For concept stage projects, the A' Award is an early indicator of success for the concept stage products, this lets young designers and design companies to register and patent winning products, systems and services for commercial value generation, furthermore the A' Award connects young designers and design companies to a large industry base and setups the links between the designers, design companies and the producers. The winners ideas becomes reality. For realized projects, having the A' Award gives added value to your products and separates them from the rest of commoditized goods, it is an excuse to communicate your product to the media, a reason for press releases. Each winner design receives the trophy, published online and at our best designs book, receives a certificate and sticker templates to be attached to the products, the A' seal of design excellence is also included in the winners package, this seal is valid for the entire product lifecycle without yearly fees. Learn more about the winners' benefits here. To learn more about winners' services here. And check the contents of the winners pack here. As a brief summary, your best designs will be published, you will be provided many PR-Services, and a designer from your studio or you will be invited to our gala nights, your works / or portfolio will be exhibited in our exhibition and you will get your designs published. Furthermore we will provide Design Mediation services in order to connect your company to other companies. We will actively be searching for prospective clients for your design studio, and we will present your porfolio to these clients only (Your PDF portfolio will not be visible to others, it will only be visible to prospective design buyers who are registered to designmediators.com). The Excellence in Design Award, different from other design award categories do not consider a single design for judging. Your professional design portfolio will be evaluated as a whole. You must submit your porfolio, and your best 5 designs. You can send your existing designs from your porfolio or submit new designs. There is no time limit about when these designs were created. The Aim of the Excellence in Design Award is to attract the attention of media and big-players to professional designers by means of creating publicity and dissemination and also to seperate the real talents from the rest of the actors in the design world by honoring them with a prestigious award. Main Image* 3600 x 3600 pixels JPEG Your best design should be submitted. Optional Image #1 1800 x 1800 pixels JPEG Your second best-design. Optional Image #2 1800 x 1800 pixels JPEG Your third best-design. Optional Image #3 1800 x 1800 pixels JPEG Your fourth best-design. Optional Image #4 1800 x 1800 pixels JPEG Your fifth best-design. Documentation* Max. 40 x A4 Pages PDF Your portfolio of designs, This portfolio will not be available online if you are a winner, you can submit up to 40 pages of PDF in A4 format.